Socionext’s video distribution solutions allow communication and show content that attracts viewers. Offering the most advanced encoding that maximizes value for video distribution as well as the video compression and expansion technologies that not only reduce the number of bands required for video distribution, but also reduce the storage capacity for content, we provide new value to our customers. Using our video codec technology, we have realized a real-time encoder with broadcasting quality compatible with the most advanced H.265 (HEVC) format on a single chip for the first time ever. The performance and image quality of this encoder are highly admired by professionals in the field of imaging. 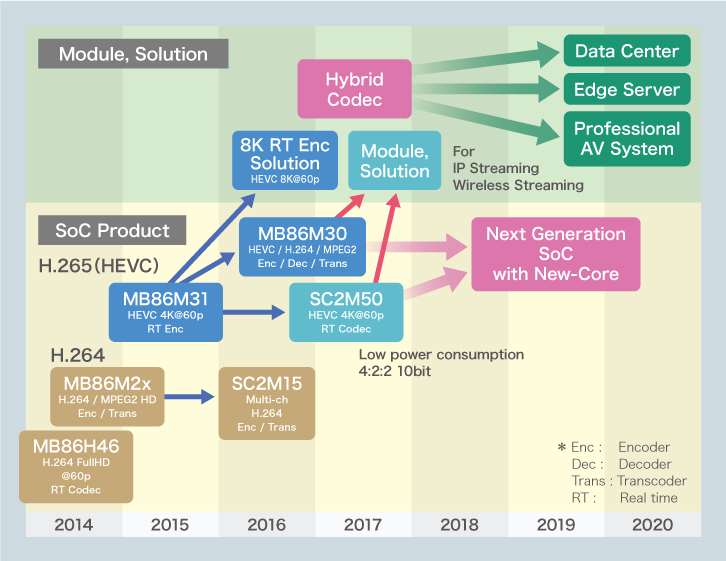 Going forward, we will continue challenging ourselves to realize advanced technologies such as support for 8k and next-generation codec formats while leading the world with our unique technologies and expertise.